#Badgers Iverson out with 5 pts, 2 boards and an assist. Huge. Wisconsin on a 12-2 run to take a 20-14 lead, sparked by the Badgers ability to get into the low post and convert. Med with two back-to-back buckets!! #Badgers Gard imploring UW to touch the post. #Badgers Gard: Pass the ball Vitto. Koenig has 11 points -- he's 3 of 6 from 3-point range -- and UW leads 25-21 with 5:01 left. Wisconsin leads 25-21 at 5:01. Koenig with 11 points to lead all scorers. UW with 10 points in the paint and 12 from 3-point line. Bronson Koenig has a game-high 11 points for the #Badgers , including 3-for-6 shooting from downtown. #Badgers 9 of 23 overall: 4 of 12 from 3-point range, 5 of 8 in the paint, 0 of 3 on 2-point jumpers. 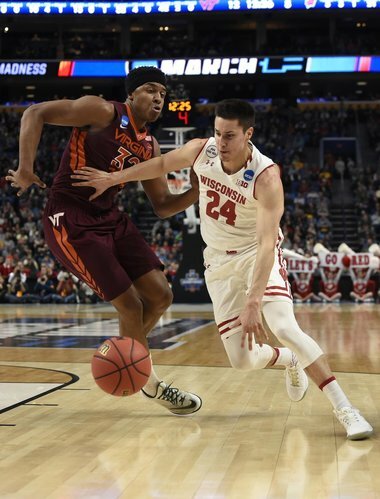 #Badgers ' Bronson Koenig might still be feeling effects of chest cold. Was gassed at end of that run, which went a long time w/o a stoppage. #Badgers Iverson in for 8 minutes so far: 5 pts, 3 boards, 1 assist. Virginia Tech has six turnovers in 23 possessions. #Badgers up 28-21, 3:27 left. Another quick media timeout. Wisconsin up 28-21. Hokies scoreless for the last 3:04. Key stat; #Badgers 7 assists, 3 TOs; Hokies 5/6. Bench points: UW 8, Virginia Tech 6. It's early, but that's, um, unexpected. Seven different #Badgers have scored, led by Koenig (11) and Iverson (5). Hokies held scoreless over the last 3:04. This is Lundquist's fourth announced game in a row and he's still got his fastball. Spanarkel (color guy) sounds like he needs a coffee. #Badgers Koenig getting beat off the dribble tonight. #Hokies on a 5-0 run and are down 30-28 with 1:30 to play in the first half! Showy stepping up this half! ???? Buzz lost the jacket and now he looks like he should be dealing Faro in Tombstone. 3 point game with 30.7 to play, 33-30. #Badgers have 33-30 lead with ball OB: 26 on shot clock, 30.7 left in half. Khalil Iverson splits a pair of free throws. On the Virginia Tech inbound, Showy nearly grabs a steal. Timeout VT.
Iverson has been a beast today. 8 pts already. Good to have him back. Halftime: #Badgers 34, Virginia Tech 30. Koenig with 11 points, Iverson 8 points and 5 rebounds. Leading at the break. ??? ?